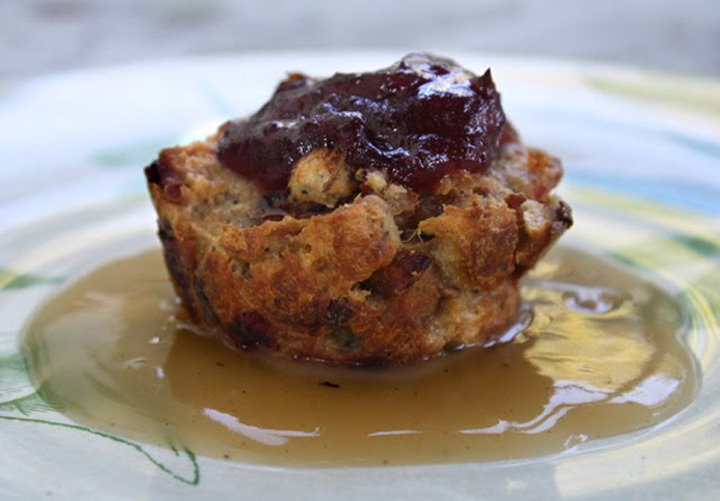 The easiest and quickest use of Thanksgiving leftovers is to just pile them between 2 slices of bread or bread roll. I like mine with stuffing, cranberry sauce, warm gravy and turkey. But to kick the sandwich up to an Ultimate Turkey Sandwich, just crisp up in the frying pan some of that uneaten soggy turkey skin. 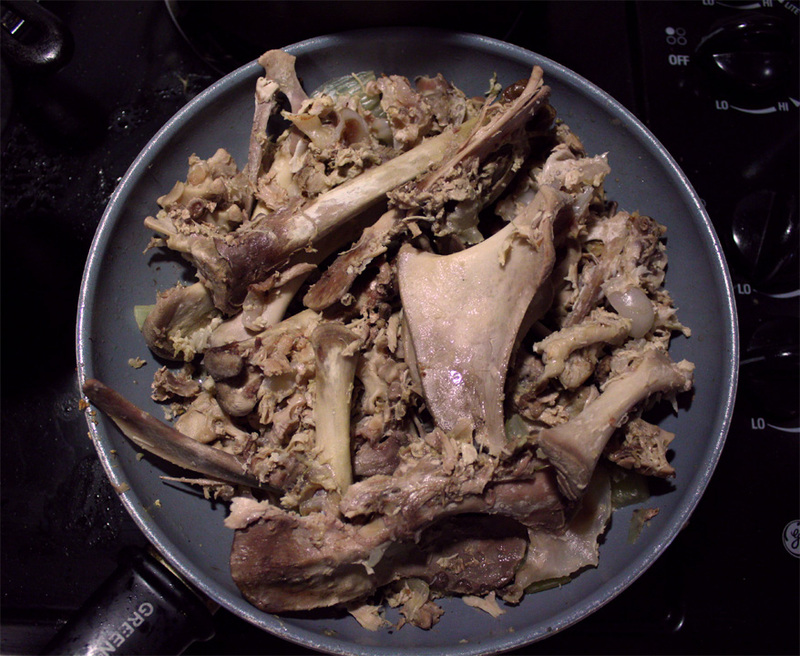 For the tastiest soup it's best to boil leftover roasted turkey bones and turkey bits in a pot of seasoned water. Once the water is simmering on low, just step away for an hour, and meanwhile do a little veggie and leftover turkey chopping to add with strained turkey broth. 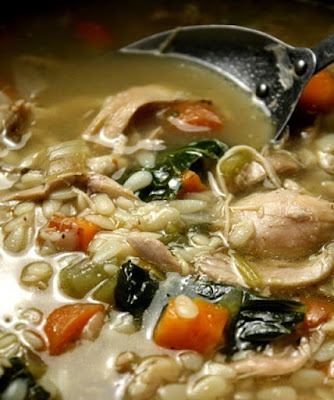 My Turkey Soup recipe link here, is based on a typical Chicken Soup, so just substitute with cooked leftover turkey. 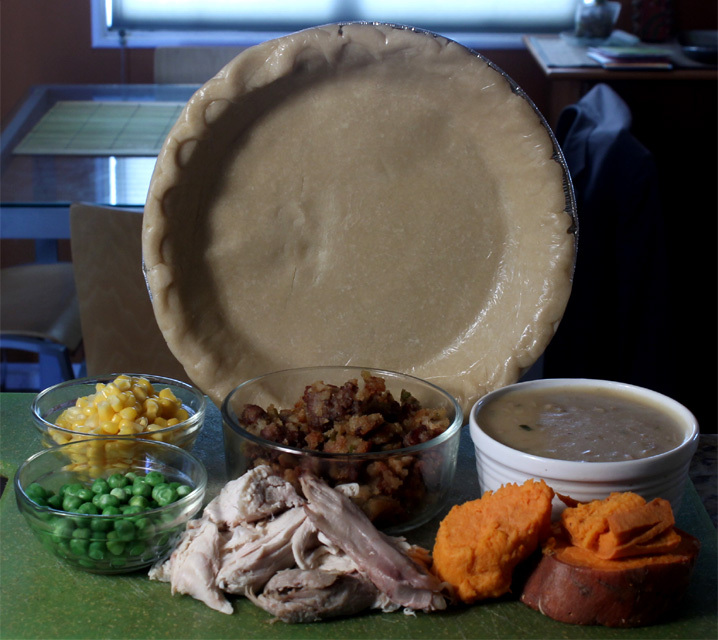 A pot pie is the most soothing of winter meals, and my Turkey Pot Pie made with Thanksgiving leftovers will have you returning for seconds and thirds! For my simple recipe I used a grocery store frozen pie crust that covers the leftovers. And all you do is load up a deep baking dish like you would a lasagna - layering mashed potatoes or yams, veggies, stuffing, turkey and gravy. 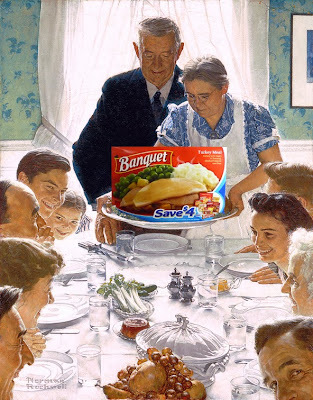 I hope you had a great gathering of family and some friends for your Thanksgiving. And do check back for more 99 cent cheap$kate deliciousness. It's the most busy and overwhelming cooking day -- well don't fret, The 99 Cent Chef wants to take the stress out and make it a bit easier for you. I got it all here: my holiday recipes, along with a cupboard full of money saving tips for you during this Thanksgiving season. 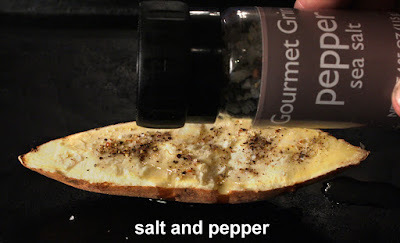 Read on and click on any highlighted recipe name to read my original blog post for the recipe, illustrated with yummy photos, fun video and text. 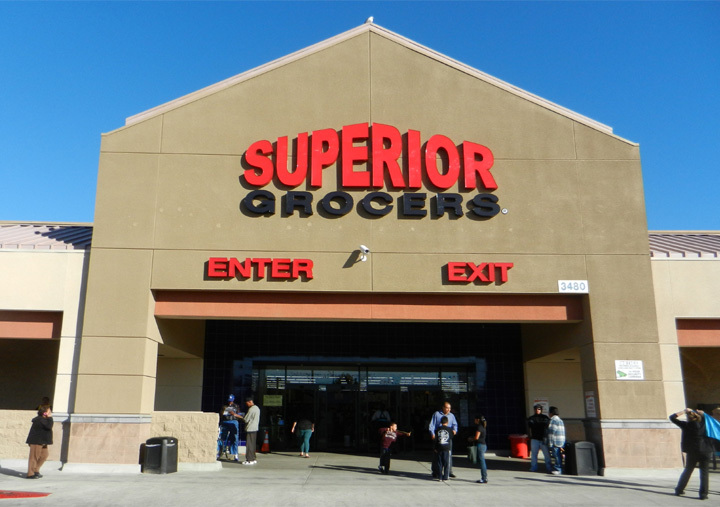 First up, if you live in Los Angeles, the Grinchiest Chef would recommend getting fruits and veggies at any Superior Grocers -- just click here to see the great deals to be had, it's incredible. They cater to Latin clientele, but everyone is welcome. 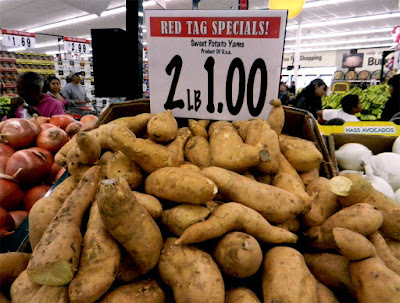 In the recent past Superior Grocers have sold yams at 5 pounds for 69 cents, russet potatoes 8 pounds for 99 cents, tomatoes 4 pounds for 99 cents, yellow onions 7 pounds for 99 cents, green bell peppers 5 for a dollar, and collard greens for 69 cent per pound - oh boy! Nickle Ad from Gonzales, Louisiana - always read the fine print. I'm sure there are turkey deals to be had wherever you are during the holiday, so this week check out those grocery flyers in the mail, before you give them the heave-ho. But seriously, I posted my version of a Turkey with Stuffing recipe, and click here to read all about it. 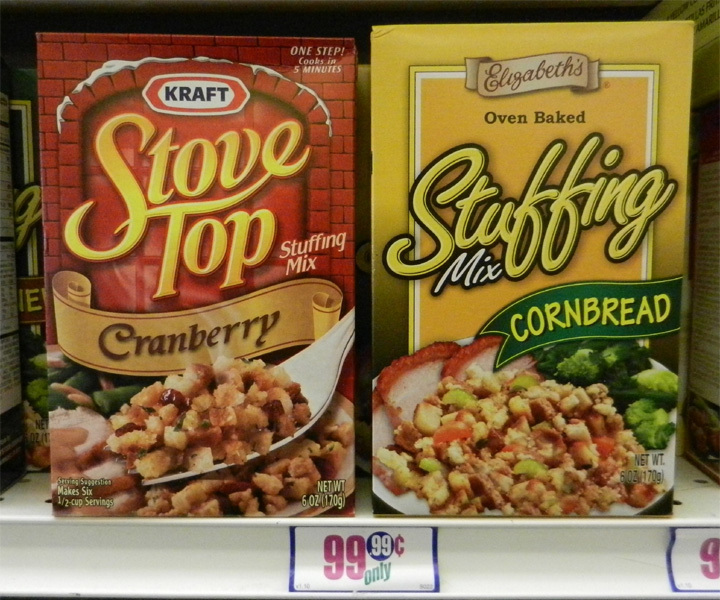 My blog post also features my Mother-in-law's decedent Sausage Stuffing. I shot a video below for you, and it's done in my movie technique of stop motion animation to boot. 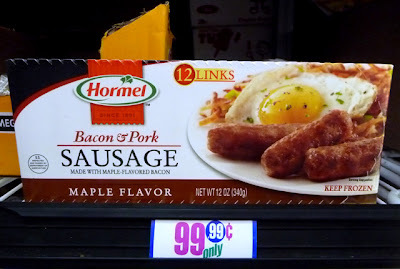 My recipes are stuffed with cooking tips and cheap shopping sources like my local 99c only Store that carries boxes of stuffing and Hormel Bacon & Pork Sausage Links for, you guested it, 99.99 cents. Right now they are selling everything but the bird! Make your own Homemade Cranberry Sauce by simmering two cups of fresh cranberries in a simple sweet syrup. 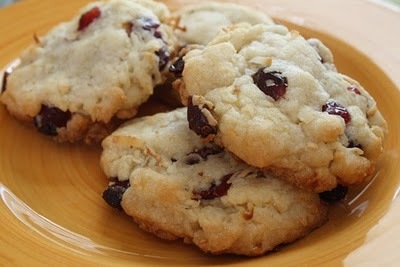 My original recipe uses fresh strawberries, but can use almost any fresh fruit, including cranberries. Boring Creamed Spinach is a typical Thanksgiving side, but I have a Hindi twist. 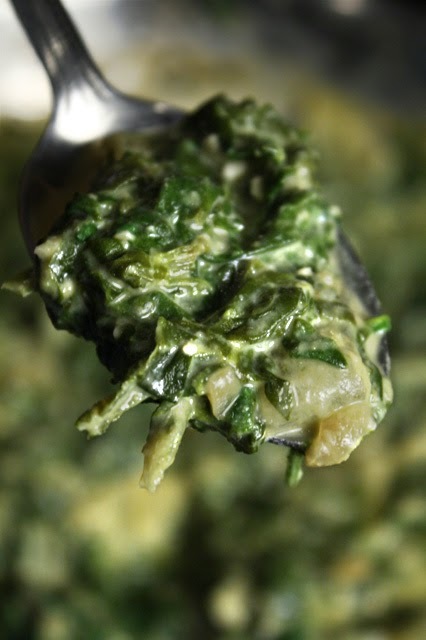 One of my favorite India restaurant side dishes is Saag Paneer, which is just like creamed spinach, but with cheese and the added spice punch of ground cumin . My version is made with easy-to-get (and lower fat) cottage cheese instead of Indian Paneer (cheese) and Ghee (butter). Once you and your family try my cheesy and creamy Saag Paneer, you won't go back to Creamed Spinach. And the recipe is a click away, here. I hope you all have a great holiday. Keep checking back here for more budget recipes and loads of new food videos. I usually bake Yellow Sweet Potatoes, but while there are a few warm days left it's nice to get outside and fire up the BBQ grill. So let's get cooking with The 99 Cent Chef. 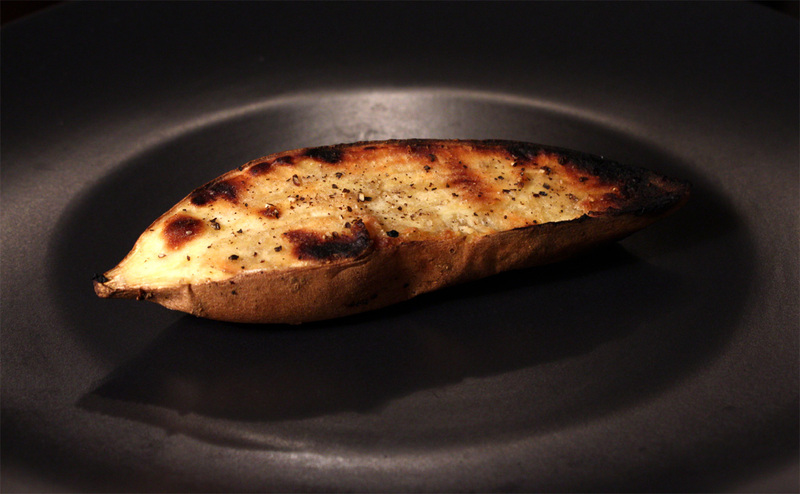 My stop motion video features Grilled Yellow Sweet Potato. This Frugal Forager gets them from the local Latin grocery store. I picked up a couple of tan, yellowish, ones. I usually cook with the red sweet potatoes as they are the sweetest, but I like the mild sweetness you get with tan, or yellow, sweet potatoes. The tan sweet potato has flesh that's white to yellow in hue. 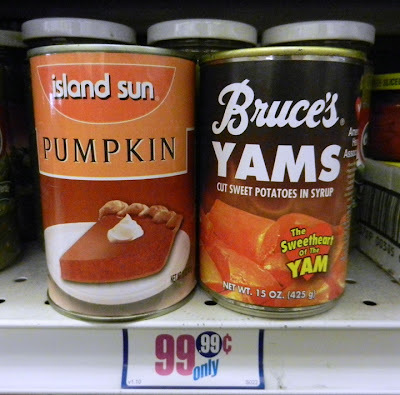 You can use my recipe with yams or sweet potatoes. 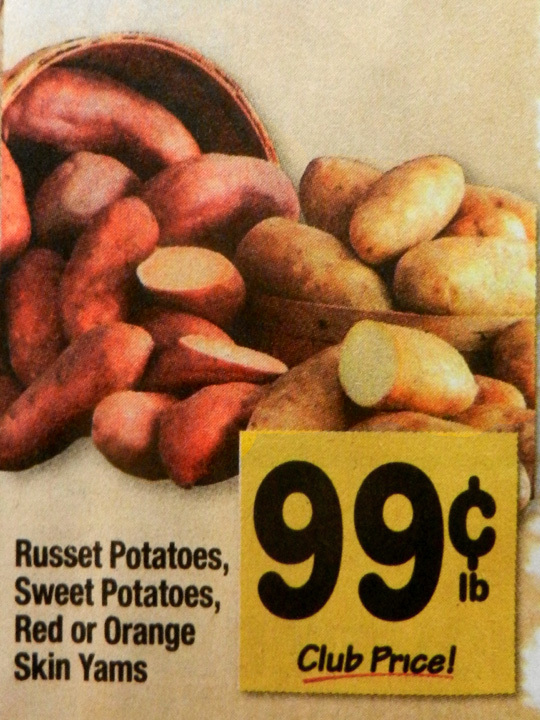 Sometimes grocery stores call the red and tan (yellow) tubers yams (at least here in the U.S.) You can read about the difference between a yam and sweet potato by clicking on the names. I have a cheap gas grill, so it's easy to keep track of how long it takes. If you have a charcoal or wood burning grill the cooking time will vary according to how intense the fire is, and you will have to watch things closely. What you are looking for is a a slight char or burn. When the Yellow Sweet Potato is soft to the touch then it is done. 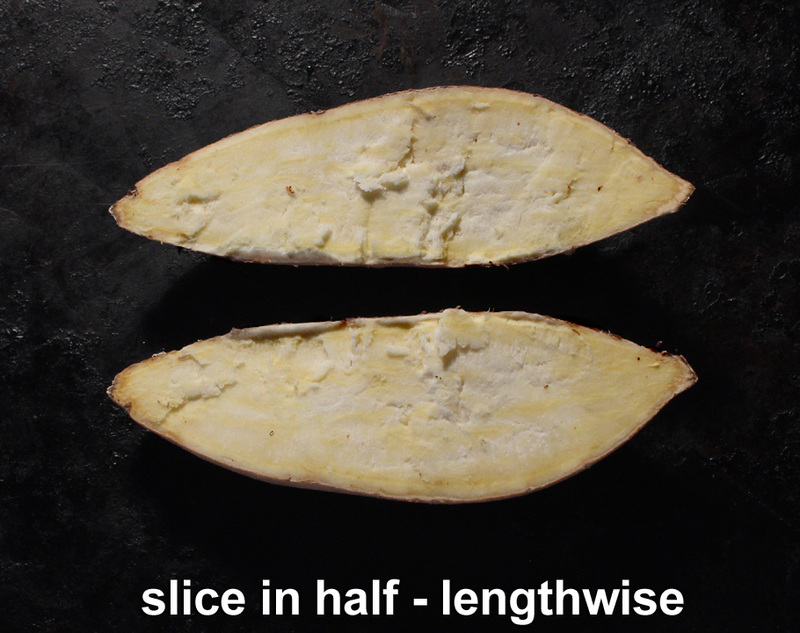 I slice the tubers in half lengthwise. I also leave the skin on. It's up to you how you like to prepare them. 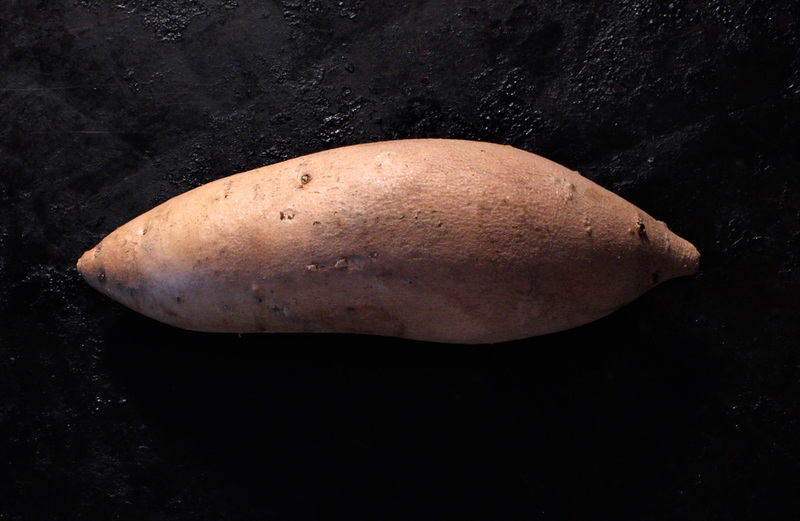 It's okay to slice sweet potato anyway you like. The grilled Yellow Sweet Potato will continue to steam and soften after removal from the fire. And you can easily peel off the most blackened skin parts if you like. Me, I like some of that charred flavor. You can adapt this recipe for indoors cooking too. I like broiling them in the oven. Just check on them every minute or so. Some of the smokiness is lost, but the sweetness and char flavors still come through. You could even roast the Yellow Sweet Potato in the oven, especially if you are baking a chicken; it takes about 30 minutes of baking, so add the slices a little over half way through baking. And be sure to cook plenty. Grilled Yellow Sweet Potato makes a low calorie side dish and can be easily reheated anytime. 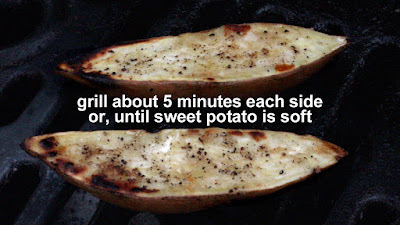 Pull the grilled wweet potato slices out of storage from the refrigerator and zap them in the microwave for about a minute or so. 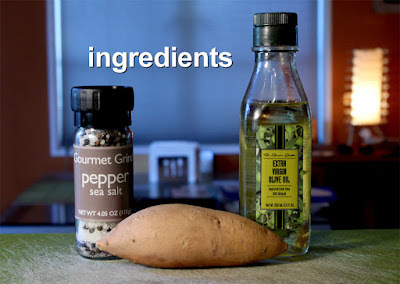 My Grilled Yellow Sweet Potato recipe works with almost any other crisp veggie like: corn, cauliflower, broccoli, carrots, yellow neck squash, onions and asparagus. If you've never put vegetables alongside that barbecuing burger, hot dog or chicken leg, now is the time to start. And you can't do better or easier, than Grilled Yellow Sweet Potato. Play it here, video runs 1 minute, 23 seconds. Scrub and clean sweet potato if necessary. To speed up cooking, microwave sweet potato about 2 minutes -- this is optional. 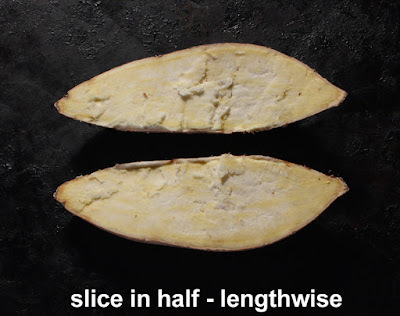 Slice sweet potato in half lengthwise. Each sliced half was about an inch thick. 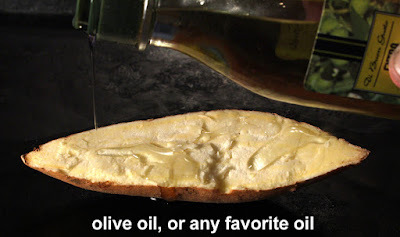 I left the potato skin on, but you can peel potatoes if you like. For huge sweet potatoes you may slice potato in half, then slice each half one more time to reach 1 inch thickness. Your cooking time will vary depending on the grill heat. I used a gas grill and it took about 5 minutes for each side of sweet potato to cook through. You want the sweet potato to be soft on the inside when done. I noticed that even if the middle is slightly hard, the sweet potato will continue to cook and tenderize, even when removed from the fire. So don't worry if all the cooked slices are not uniform in doneness, they will continue to cook some, even off the grill. This recipe works with any toothsome tuber or yummy yam, including: red, white, russet, yellow and red yams. This is one sweet Deal of the Day. 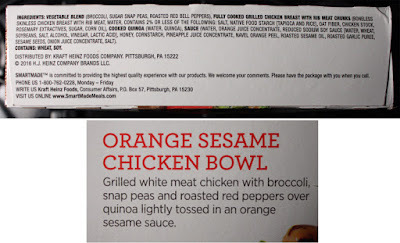 And it's a delish Orange Sesame Chicken Bowl by Smart Ones, under the banner of SMARTMADE. I am a fan of Smart Ones by Weight Watchers, and this frozen entree lives up to their tasty reputation. You first taste the sweet orange sauce. It is flavored with pineapple juice too. There is a slight hint of soy sauce that's listed as low sodium. 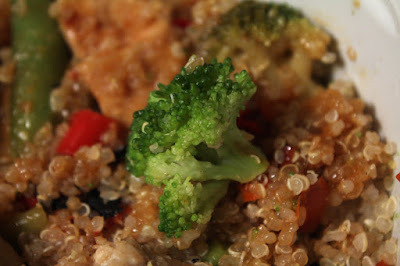 It is sticky and thick, so make sure you stir the defrosted ingredients to get it on all the chicken, veggies and quinoa. I would like more sauce, but what's there is good enough. This bowl had 4 or 5 huge pieces of white meat chicken. It remained moist when zapped in the microwave - the sauce helps steam the meat. And it is real chicken, not sliced from a processed poultry loaf. 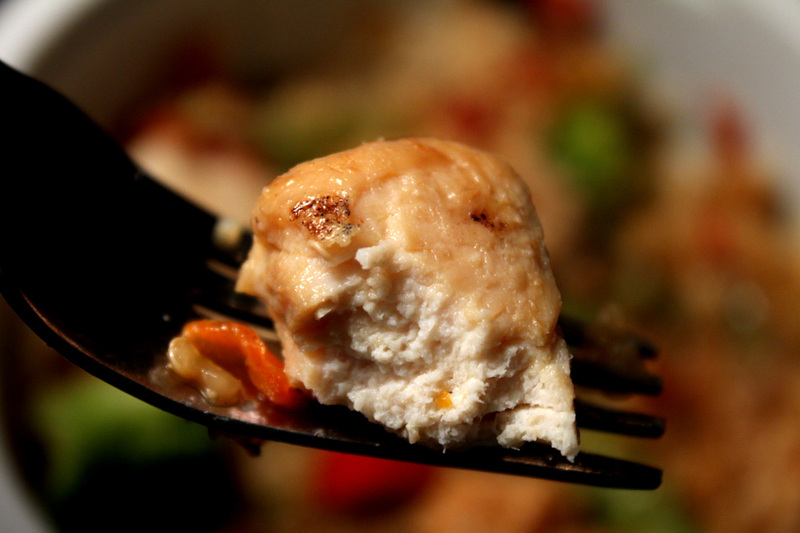 The photo shows sesame seeds covering the chicken. 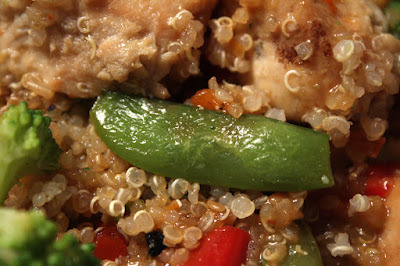 I could not taste the sesame seeds as the quinoa was so similar - not that it matters much. I liked the large veggie pieces of broccoli. 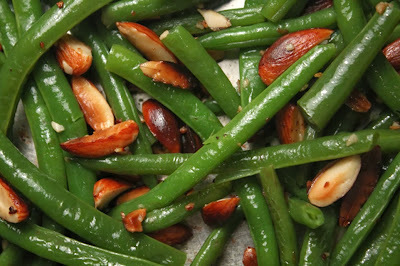 The whole snap peas remain firm and fresh tasting. And small squares of red bell pepper add the right amount of pungent flavor. This is one well balanced bowl of savory and sweet. This oriental-style stir fry is made with quinoa instead of white rice and that's a good thing. 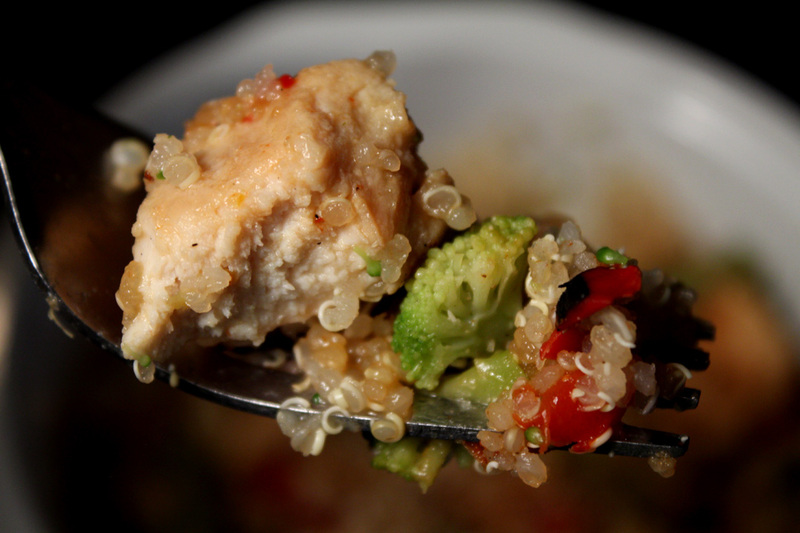 I prefer rice, but am starting to warm up to tapioca-like pearls of quinoa. 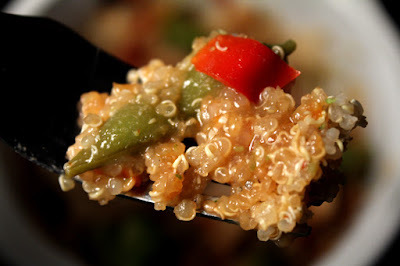 If you have not tried quinoa it is usually steamed, and when done the tiny round seeds pop when bitten. The taste is a grain flavor, with a very mild oats taste. If you are eating glutten-free, this is for you. Quinoa comes from a flowering plant that originates in South America. 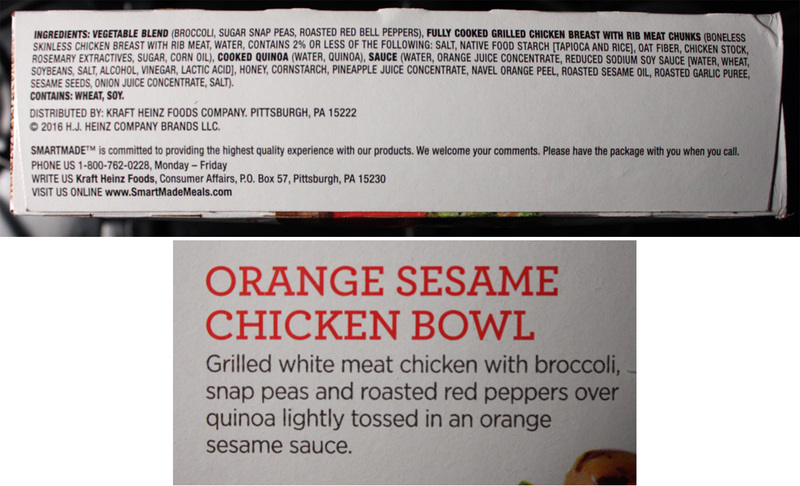 At 9 ounces this is a light lunch, but with the addition of quinoa, it is quite filling for it's small package. The ingredient list is small with mainly real ingredients and no fillers or chemicals. Once again Smart Ones have come up with a real winner of a frozen meal. 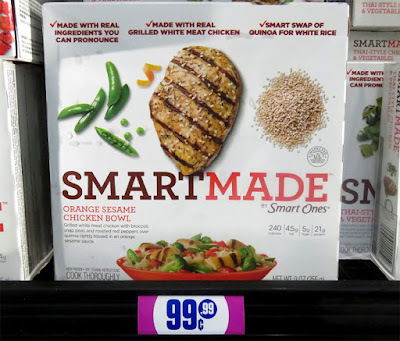 So on my Cheap$kate Dining Scale of 1 to 9, 9 being best, I give SMARTMADE Orange Sesame Chicken Bowl by Smart Ones a perfect 9 ! This is one delish Deal of the Day made with fresh and real ingredients, so get a few of them if they still carry them in the 99c only Stores - hey, get a few from any grocery store at full price, it's worth every penny.